During the three years I lived in Harlem, before 1920, Italian and Jewish vendors went all through New York City, particularly in the poorer neighborhoods, shouting out their wares. They all used either a pushcart or a horse-drawn wagon. Especially in winter, when a vegetable vendor got an order and went in to deliver it, the gang I belonged to would steal just about all his potatoes and run like hell when he came out. If he started chasing us, we'd go into a building, dash up the stairs, and run a whole block across the rooftops, because all the buildings were the same height then. We'd head for a vacant lot, dig a pit, place the potatoes in there, light some wood on top, and wait around until the potatoes were done. Most of the time they were scorched on one side and almost raw on the other, but we'd start gnawing them anyway. We didn't have salt or any other seasoning, but never in life have I tasted potatoes that were so good. On Halloween day, kids came to school armed with chalk or crayons, which they scratched on the windows of commercial businesses on Lenox Avenue. Some would go up on the roofs of the tenement buildings where they lived, taking some paper bags and a bucket filled with water. They would shout down on the passersby and drop a bag full of water on their heads. By the age of 8, I was already reading newspapers. I recall reading about the U.S. declaration of war against Germany in 1917, and the dirigible balloons  zeppelins  that were bombing London. It caused some concern that the giant dirigibles might cross the Atlantic and bomb New York. The mayor, John Hylan, ordered a blackout each night, like the authorities did in London. Citizens were ordered to pull down their window shades after dark, so that any type of aircraft would have difficulty seeing where to drop their bombs. At that time I was living with my father and his second wife on 133rd Street, in a five-story building of flats. My Dad came home one night, and as soon as he hit the first step, he began to shout, "The Germans are all over the city!" Of course, that caused quite a commotion. Some of the other tenants did not think it very funny when they discovered that the old man was just indulging in a big joke, and they let him know it. My father was absent so often that I spent about half of my stay in New York in a boarding home for kids of working parents. A lot of times I felt lonely, but I learned to enjoy myself. Maybe that's one reason I started reading so much. I went to the library on 135th Street, and if they didn't have a book I wanted, I'd take the subway to the main library downtown. My favorite newspaper was the New York American, because it always had sensational headlines about criminal activities, and it had good cartoons. Except for crime stories, the daily papers had very little coverage of the black community. I didn't expect to see it then, for the same reason I don't expect it now, although it's slowly changing. If you wanted to find out about black entertainers, writers, athletes, business leaders, black social activities and black church events, you had to read the black press. Harlem had a weekly black paper, the New York Age, which some kids sold on the streets. It was owned by Ferdinand Q. Morton, one of New York's most powerful black politicians. The Chicago Defender had the largest circulation of all the black papers; it was national. Then a little later, the Pittsburgh Courier put on a mass drive and became even bigger than the Defender. 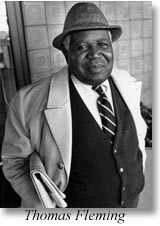 A few black reporters wrote for the white press, such as Eugene Gordon, a staff man on the Boston Globe, and George Schuyler, a columnist for the Pittsburgh Courier who also wrote for The American Mercury, H.L. Mencken's magazine, which was founded in 1923. A lot of blacks didn't like him because of the acidity of his pen. He criticized all human behavior, in the same way that Mencken did. They admired one another very much. In New York, Chicago, Detroit, Los Angeles and other cities outside the South with a large black population, you began to see the creation of a black middle class, which E. Franklin Frazier, the black sociologist and writer, later called the black bourgeoisie. Frazier criticized them because he thought they were isolating themselves from other blacks who weren't as successful, even though they all ran up against the same kind of segregation. Black doctors and dentists didn't open their offices up in white neighborhoods; they made their living in Harlem, off blacks who weren't well-to-do. I thought it was a hell of a contribution they were making, because they had to work just as hard as the white doctors, but they didn't get the same fees.